In early January, Klemek debuted a new 1,800-square foot retail location and bakery at The Camp in Costa Mesa (with indoor and patio seating) located just a bit south of South Coast Plaza. On the extensive menu are breakfast pastries, cookies, buttercream cakes, tarts, and retro breads and rolls. Part of the funding for the equipment there was raised on Kickstarter. Also in the mix are brioche buns, oatmeal stout rolls, shortbreads. Her signature Marche Noir Cabernet brownies (made with wine flour,) bars, cobblers, incredible marshmallows with natural flavors, and open faced ice cream sandwiches. 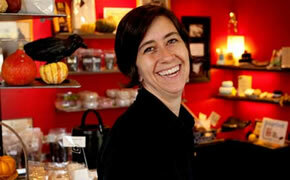 On Monday, February 11th from 5:30 to 7:30 p.m. Blackmarket Bakery at The Camp is celebrating it’s Grand Opening. 15 percent of all sales during the festivities will go to Share Our Selves. The Camp location has already been so successful that you can expect other Blackmarket Bakery retail bakery locations on the horizon.